The first 2 nights of your safari adventure will be spent at the big five Madikwe Game Reserve. Madikwe is the fifth largest game reserve in South Africa and is located on a 680 km2 nature reserve, home to approximately 66 large mammal and 300 bird species. Your 2-night stay will include 4 game drives in the animal-rich reserve, as well as all meals. You’ll end off your stay with a morning game drive and delicious breakfast, before setting off for the Waterberg region. 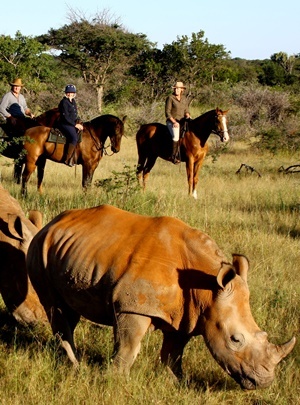 The last 4 nights of your horses & big five safari will be spent in the Waterberg Biosphere. The Waterberg is an exquisite area of pristine wilderness, with a variety of game, including the rarely seen Sable antelope. Here is where things change from the normal safari routine as not only can you choose to do the traditional game drives, but you can horse ride instead. The horses are very well trained and even if you are a novice there will be a horse for you! The advantage of the horse riding safari is that you get so much closer to the animals and being able to follow the animal trails through the bush allows you to see so much more. Those with a little more energy and leg strength can also chose to go on a guided mountain bike ride through the reserve. The only members of the big five that are not on the reserve are the elephant and lion which you will probably see in Madikwe Game Reserve. The 7-day horses & big five adventure safari will give you the traditional safari experience, taking you to beautiful locations and offering fantastic game viewing opportunities, with an added twist if you wish! Arrival in Johannesburg, collect your hire car, driving approximately 4 hours to Madikwe Game Reserve where you will be spending the next 2 nights. Arrival will be in time to settle in, have some lunch before heading out on the afternoon into evening game drive, returning for dinner. 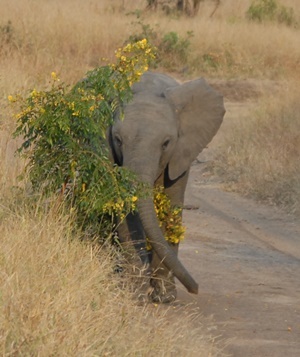 The following day you will enjoy a morning and another afternoon game drive in the reserve. During the heat of the day, lie by the pool that overlooks the waterhole or enjoy a massage. Accommodation is at Motswiri Game Lodge, inclusive of all meals and game activities. After the morning game drive and breakfast, take the road to the Waterberg Biosphere where you will be spending the next 4 nights. Arrive in time for lunch before the afternoon adventures begin! 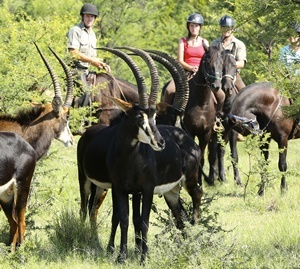 Choices – you can decide on a traditional game drive, horse-riding safari or even a mountain bike ride with your ranger. The following days you will again be able to decide what game activities you want to do and seeing how much fun the riders are having might be enough to convince you to give it a try – warning – its addictive! If horses are too fast for you, then nearby you can go for an elephant back safari (extra cost) in a big 5 reserve as well. Stay at either Ant’s Nest or Ant’s Hill – both very different yet with their own charm and all meals, local drinks plus game activities are included. This is your last morning to squeeze in the last game drive – or horse-riding safari in the bush, followed by breakfast before you have to take to the road home. The drive back is mainly on a good main highway and will take approx 4 – 4½ hrs to reach Johannesburg airport. You will arrive by the late afternoon with comfortable time to return the hire car and proceed to check in for your international flight back to London.